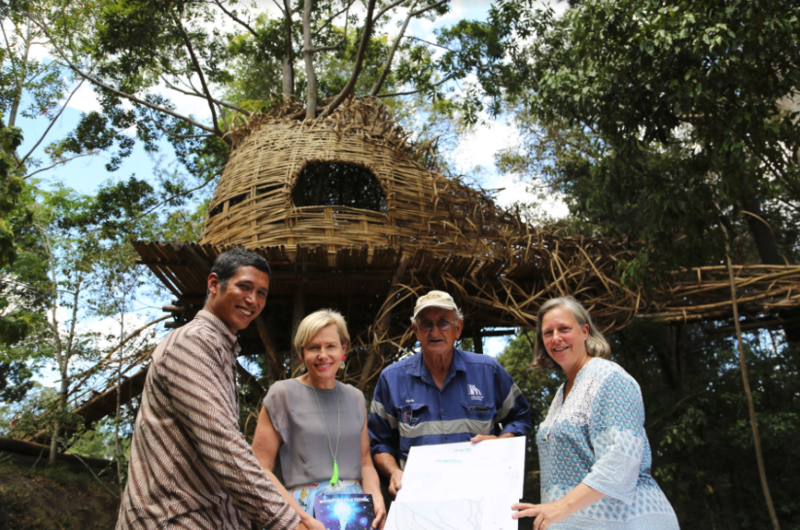 As a partnership between Woodfordia, Cave Urban—a Sydney bamboo design collective—and the International Bamboo Foundation, bamboo preservation and biochar initiatives took the organisation into a new era of sustainable innovation. Only a year since the installation of Australia’s first bamboo preservation chamber, a second chamber was installed at the Eastern Bloc prior to the 2017/2018 Woodford Folk Festival to process and preserve bamboo for the site’s many structures. Environmental scientist Arief Rabik, director of the Indonesian-based International Bamboo Foundation, developed this process to preserve bamboo for commercial use. By injecting hot smoke at approximately 120 degrees into a pressurised smoker containing water-soaked bamboo, it impregnates the bamboo with tar compounds which act as a pesticide and fungicide. A by-product of the bamboo treatment is biochar which is a soil ameliorant and carbon sink capable of boosting soil productivity. Also installed on site in recent months is our very own biochar pyrolysis machine used to heat, but not burn bio material. Biochar has enormous soil treatment capabilities, by creating homes for microbes and increasing water storage capability which in effect drought proofs soil. Most importantly, biochar sequesters carbons back into the soil and in the longer term, the gases released by the burning process can be used to generate electricity. To find out more about biochar and our bamboo preservation projects, check out this year’s Planting programme.